Earlier this week my little girl went to bed early, and I thought it was the perfect opportunity to get some much-needed sleep. My nighttime ritual always includes reading, so I picked up my Advanced Reader Copy of Mary E. Pearson’s newest novel that's due out in September, The Miles Between. The last book I read my Ms. Pearson, The Adoration of Jenna Fox, was one of my favorites of last year, and I should have learned my lesson based on the all-nighter I pulled to finish that one. But I didn’t, and my plan to go to bed early ended the minute I opened up the book and read the first chapter of The Miles Between. It’s October 19th, and teenager Destiny Faraday is beginning what appears to be just another normal day at one of the many boarding schools she’s attended since her parents decided they didn’t want her around when she was a young girl. However, that soon changes when Destiny meets a substitute calculus teacher after breakfast who asks her what she wishes. She says she would just like one fair day and almost immediately happens upon a car with the engine running. Just knowing that she is meant to take the car, she is soon on the road trip of her life with three classmates. Along the way, coincidence, magic, or maybe just pure fate turn it into a truly fair day for all four of the teens, and Destiny is finally able to begin healing from her parent’s abandonment. First, I want to say how thankful I am for young adult authors like Mary E. Pearson. For the past few months I've been lamenting the poor quality and silliness of nearly every new young adult book I've read this year. Laurie Halse Anderson's Wintergirls and now Pearson's The Miles Between have restored my hope that there are still high-quality, well-developed books being written for teens. It seems though that you have to read a lot of not-so-good stuff before you find the good ones. Destiny Faraday is a character that I immediately liked from the very beginning of the book. It's apparent that she's been deeply hurt because she tries very hard not to let herself or other people get close to her. But she puts on a front and acts like everything's fine. Her inner dialog is funny and snarky and touching all at the same time. Destiny's classmates are also likable and quirky in their own ways. Even the annoying Mira won me over midway through the book. The road trip is filled with adventure and funny coincidences that I think many teens will enjoy. But along with the funny moments are bittersweet moments and heartbreaking moments. While I was on the journey with Destiny and her friends, I smiled, I laughed, I snorted, I cried, and was not sad at all that I had missed a couple hours of sleep to take part in the journey. Mary E. Pearson is a true asset to the world of young adult literature, and her beautiful, powerful, and well-thought-0ut writing has made me a true fan. Tricycle Press just released the newest installment in their "Busy Animals" series. 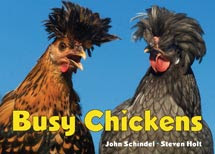 This board book features beautiful full-color photographs of different types of chickens performing actions like scratching and perching. Not only is this is a great book to teach kids action words, but it's a fun way to see all of the different kinds of chickens out there. We are most impressed with the chickens with mohawks at our house. Our good friend Scaredy Squirrel is back, and you can probably guess by the title what Scaredy Squirrel is afraid of--sleeping of course. After all, you never know what kinds of bad dreams you'll have. Scaredy Squirrel has lots of ways to stay awake, from counting stars to making scrapbooks, but when a horoscope tells him that all of his dreams will come true, he devises a plan in true Scaredy Squirrel form that will surely keep him awake. 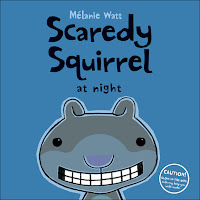 Fans of Scaredy Squirrel will not be disappointed, and parents will probably be asked to read it over and over again. Scaredy Squirrel's glow-in-the-dark teeth on the jacket flap add an additional surprise. This is a perfect bedtime story that may just help ease fears of sleeping in your little ones. Thanks to Layla at Reading is Fundamental (RIF) for sending me the following information about RIF's 2009 Read With Kids Challenge.
" US Airways (LCC) has joined with Reading Is Fundamental (RIF) for a second year to celebrate the wonder of reading through the "Fly with US. Read with Kids.®" campaign. It features the online Read with Kids Challenge and supports RIF programs serving children across the nation. The 2008 Read with Kids Challenge achieved overwhelming success in its first year with more than 16,000 participants logging 3.8 million minutes of reading. This year, the challenge is climbing to new heights with a goal of collectively logging 5 million minutes spent reading with children from April 1-June 30. Participants can register and log their minutes online at www.RIF.org/readwithkids. Registrants can join individually, or new for this year, create a team of three or more adults. All participants will be entered to win a grand prize drawing of a Walt Disney World®; Resort vacation package from US Airways Vacations, US Airways gift cards, and other great prizes. The team determined by random drawing will win the opportunity to select a featured RIF program, as well as a school in their community, to receive a special children's book collection. "US Airways is proud to team up with RIF to help children throughout the country discover the joy of reading and provide them with a better foundation for success," said Doug Parker, Chairman and CEO of US Airways. US Airways—the official airline of RIF—is also encouraging customers, employees, and readers nationwide to support children's literacy by making a donation to RIF. Donors can receive a special edition of Off You Go, Maisy!–a children's book by best-selling author Lucy Cousins-and be eligible to receive up to 5,000 US Airways Dividend Miles. "RIF is grateful to US Airways for their continued support," said Carol H. Rasco, President and CEO of RIF. "We hope to build on the incredible success of last year's campaign-not only raising awareness of the importance of reading, but encouraging participants to support the children in RIF programs across the country, which provide books to children who otherwise might not have access to them." US Airways' campaign with RIF, the nation's oldest and largest children and families' literacy nonprofit organization, also provides books and literacy services to children served by RIF programs throughout the country. US Airways' employee volunteer corps, the Do Crew, will participate in RIF book distributions and reading rallies in communities where the airline has a large concentration of employees and passengers: Boston; Charlotte, N.C.; New York City; Philadelphia; Phoenix; Pittsburgh; and Washington, D.C."
Obama Reading "Where the Wild Things Are"
I've been on a bit of a blogging hiatus because a project at work is taking almost all of my energy. I'll be back soon with some reviews. In the meantime, check out this article about President Obama reading "Where the Wild Things Are" at today's Easter Egg Roll at The White House. When you think of a children's book about different religions, you may expect two-page spreads featuring a different religion on each spread, dull narratives about each religion, and maybe a picture or two. Boring, right? Luckily, The Global Fund for Children, has brought us a look at different religions in a completely different, engaging, and unique way. Instead of focusing on one religion at a time, Faith, gives us glimpses of different faiths by demonstrating how they're alike. Two-page spreads feature a different element of faith, such as festivals or food and drink, and full-color pictures with extended captions show children around the world celebrating their faith as it relates to the topic. For example, on the spread about festivals, we see a smiling child in Guatemala peeking out from an Easter mask, children in India celebrating Diwali, children in South Korea celebrating Buddha's birthday, and children in the United States participating in a Native American potlatch ceremony. What is most compelling about this book is that through very few words, it gives children an overview of the world's faiths and celebrates diversity and religious tolerance. The text is sparse and lets the beautiful pictures do the explaining, so don't expect to find dense explanations of the different faiths. Instead of feeling like a lesson, children will be captivated by the pictures and will likely have many questions about the different children, countries, and religions featured in the book. The back matter includes a brief paragraph about the different elements featured in the book as well as a glossary of different faiths and religious terms. I'd recommend this as a jumping off point for discussion of different religions and can see it being used at both home and in the classroom. 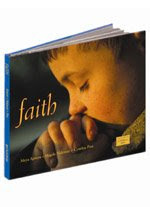 The Global Fund for Children has given us a real treasure with their latest book, Faith. I highly recommend it. Visit Scrub-a-Dub-Tub for more Nonfiction Monday selections. Stinky is a monster who lives in a swamp with his pet toad Wartbelly. It's a wonderful place with a bottomless pit, a possum tree, stinky mud, and lots of animal friends. Wonderful that is until a kid named Nick builds a tree house in the swamp. Stinky can't believe a kid would like his swamp because kids like baths, being clean, candy, and apples. Stinky tries to discourage Nick from playing in the swamp by placing Wartbelly in the tree house, hiding Nick's hammer, and trying to scare him. All of these attempts fail, but then one day Nick isn't in the swamp and Stinky feels bad. He might even miss Nick. What is Stinky to do? This is a nice story about friendship and finding friends in people or monsters that you might not expect. There is a lot of humor, and it's clear where the story is going but that is part of the charm. Stinky is not scary, and Nick might not be a typical kid. Both of them have misconceptions about each other and are also curious about each other. They become friends of course, and in the last panels of the comic, Stinky tries one of Nick's apples and loves it. Stinky immediately offers Nick a pickled onion. The comic ends before Nick takes a bite. I did want to see if he would like it or not. The art work is wonderful. There is a lot of detail without it feeling cluttered or cramped. I loved the frogs, possums, and rats greeting Stinky as they go about their daily business. There are mini glimpses into the activities of the other swamp inhabitants as you follow Stinky and Nick through the story. The colors are muted and perfect for a swamp or forest. The characters have a round quality to them which creates a soft feeling. There is often only one character speaking per panel, and this makes it easier for beginning readers to know who is speaking and not to be confused about which bubble to read first. The language is simple, and there is enough word repetition for beginning readers. There is also a nice map on the back end papers of the swamp and its landmarks (another example of the great details in this book). This is a nice jumping off place to create a map of your neighborhood, park, or some other special place. Kids also might have fun remembering when they met a friend for the first time. Toon Books have been very successful in publishing high interest and quality comics for beginning readers. Stinky has appeal for both boys and girls. I look forward to more comics from Eleanor Davis. See more sample pages, and download a lesson plan and activity sheet at the Toon Books Website.